The crackling is so nice!!! Will you be posting this up in english soon? 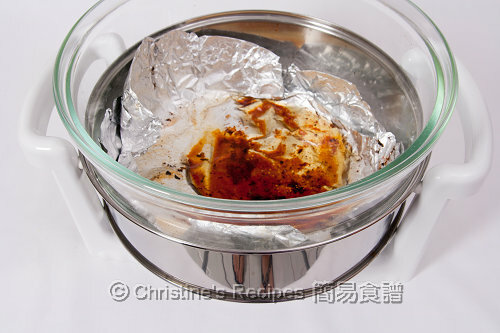 "放入滾水中拖水約15分鐘，至六、七成熟。" Just put in a boiled water or need to continuously boiling for 15 mins? Of couse, need to keep boiling for 15 mins. Otherwis it can't be 60-70% cooked. 我屋企冇焗爐, 我嘗試用煎的方法, 首先將朱皮煎香, 再煎肉. 雖然朱皮冇焗爐烤得咁脆, 但都似模似樣, 也不失為另類的方法. What is the brand of the conventional oven that you're using? Can you share with us? Oh, that's Mezzo. Very cheap brand. Nice though. 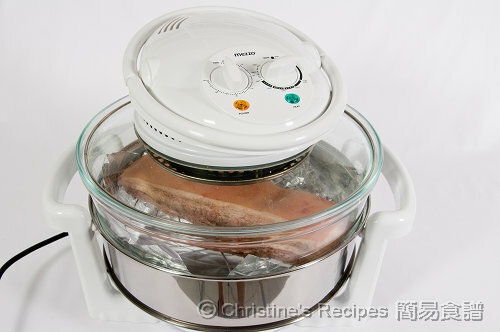 請問你的convention oven 在那兒買? (香港叫光波萬能煮食鍋12L 售$1290),剛有朋友會去澳洲想托她買回來^^, tks. 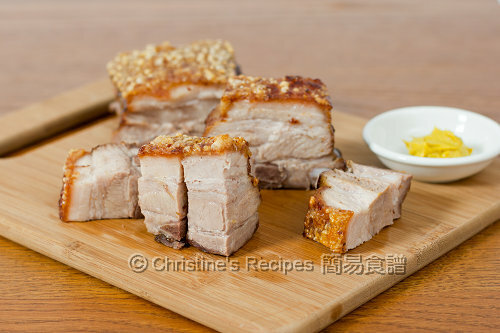 Yes, continue to cook the pork in boiling over medium heat, and blanch for about 15 mins. I tried the roast pork recipe this past weekend. Somehow, the 皮 is not cracking after more than 1 hour. Is it something that I missed? I used the regular oven - "bake" to do it. At last, I use "broil" and it kind of burned the 皮 because the heat was so strong. After shaving off the burns, it tastes good though. Please advise what I should next time since the recipe calls for ~45 mins. The pork that I got is ~1 lb, not big. Is it really require to use broil in the oven? 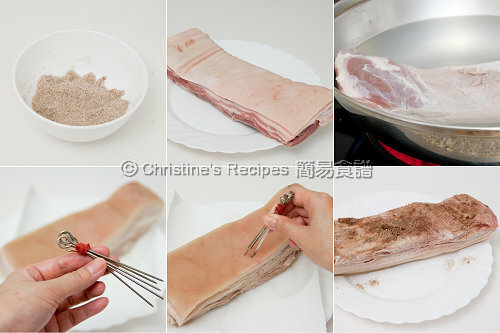 The first part of baking is to cook the pork through. The last few minutes is to grill the rind over very high heat for a shorter time compared to the first part of cooking. By doing so, the fat inside the rind will be highly hot and get released from the hole, that brings out the effect of "frying" the rind and makes cracklings. As you don't want it burned but blistered, so you have to adjust the distrance from the boiler. Every oven is very different. As in my recipe said, to make crackling, the rind has to be very dry, and poked with many holes. Can I make that cripsy pork at BBQ time? Yeah, I think you can, just like the way those BBQ shops roast the pork. Need some skills and patience though. 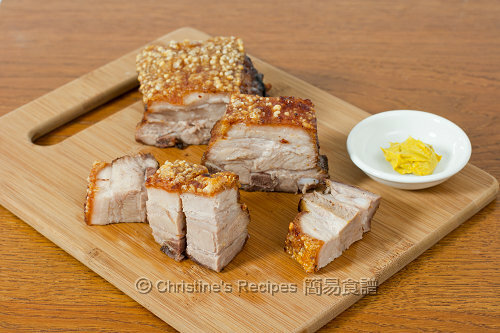 I use Conventional oven and try make pork belly today. It is so delicous. By the way, i found the needle sold in Citysuper. I used a roaster to cook the pork belly. It has a lid so my oven was still clean after cooking. I put the pork into my roaster, then covered with its lid. Baked 40 min. and then grilled about 10 min. with the lid on. It's perfect! Thanks for sharing!! How's the crackling after baking in your roaster? Was it good and crispy? I used a big roaster and put it in the upper level in the oven. I didn't close the lid completely. Maybe that's why it still worked okay when I turned it to grill. I did have the crackling, not as much as yours. The skin was crispy and pork was so tender. Most important thing is that I didn't have to clean my oven after cooking. :) Thank you for sharing this wonderful dish! It's so good, thanks for sharing. Hi Christine, 我想試整呢個, 但屋企得普通焗爐, 你又話D 油會彈到個爐好污糟, 有D擔心...我諗緊, 如果燒肉面頭鬆鬆咁蓋上一塊錫紙, 可以防彈油, 但唔知會唔會影响焗出來的效果呢? So glad that your family loved this dish. Congrats on your success !